Why RTLS? RTLS or Real Time Location Services, is best described as GPS for the indoors. It is a system that displays the real-time locations of people, processes and assets. RTLS relies on minimal hardware and can utilize your existing wireless infrastructure. Beacons provide read accuracy from zones that range from doorways and gateways to specific areas like bin locations or WIP stations. Real Time Location applications using a wide variety of tags and beacons are designed for applications requiring accurate, precise, and high update rate real-time location tracking. RTLS generates valuable data and it lets your employees focus on activities that bring value to your business. RTLS versus RFID RFID and RTLS solutions are both classified as location-based services but they are not the same. How do the two technologies differ? RFID can be passive or active. Passive RFID tags are read in proximity to their readers. Active RFID tags send a signal every few seconds to provide location information. Both passive and active RFID utilize a tag and a reader. 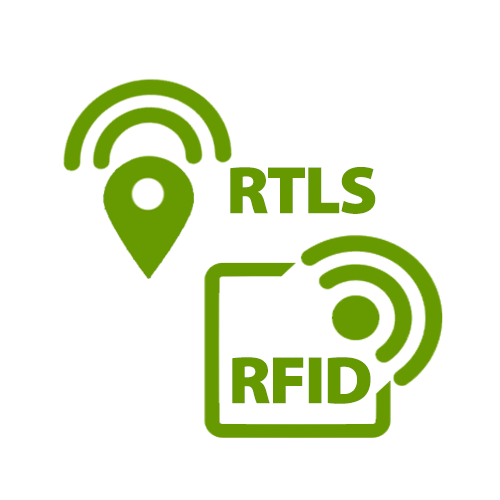 RTLS uses badges and tags reading one another with a platform required, (Wi-Fi, ultrasound, infrared radio frequency), network appliances, (readers and exciters), as well as other components like servers, middleware and end-user software. RTLS offers opportunities in almost every sector of business. By knowing where assets are located, processes then can be streamlined. RTLS and RFID Software Data Transfer Utilities and data integration BarcodeFactory offers a unique Enterprise level software that collects both RTLS data and/or RFID UHF passive labels or tag data. One Middleware or transfer utility for both technologies! We combine RTLS with a powerful business intelligence software platform to automate you workflows and optimize operation. Contact us to discuss your project. Get started by filling out the form and tell us about your tracking needs.